This is my former 1983 Riviera. I had it for approximately 3 years, from 1995-98. One of the best cars I have ever owned. It was equipped with power windows, door locks, seats, tilt wheel, cruise, astro roof, power trunk release, concert sound systems, plus all the other standard features. I really loved this car. While I had it I had it repainted, transmission rebuilt and a lot of other work done to it. Wish I still had it now. Before I had the '83 I had a 1979 Turbocharged Riviera for almost a year until some idiot hit me in the rear and totalled it. It was a dark grey with a extremely light grey interior. Very beautiful. I traded it in for a 1988 Ford Thunderbird that I also like really well. In October 1999 a drunk driver ran a stop sign and bent the header panel and hood. I had it repaired with a turbo coupe front end. I had it until January of 2000 when I gave it to my nephew who had just gotten his license. He, like all boys, decided it needed to be louder and installed a dual exhaust with glass packs. He gave it back to me in November of 2001 and I quitened it down a little. 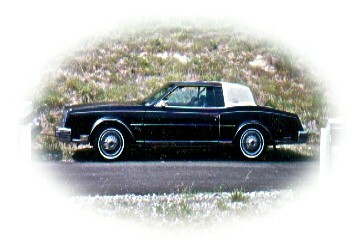 Then I gave it to my niece and she traded it for a 1979 Pontiac TransAM Bandit Edition. Now it is sitting in the Ironton OH Police impound yard. I am planning on bidding on it this summer and trying to get it back and this time I am going to keep it! Anyway, when I gave the 1988 to my nephew I bought a 1994 Ford Thunderbird LX. It was really nice. Another black car (like the Riv) with a moonroof, mocha leather interior, wood dash kit, power everything and the 4.6 V8 (really, really great power). Then I was an idiot, decided I wanted a truck. Sold the Thunderbird and bought a 1996 Ford Ranger Splash. It was a beautiful pearl green color and was equipped with a 5 speed manual, a/c, am/fm cassette, etc. Anyway, I didn't have this too long. Found out that I must have really bad arthritus in my right wrist and it was killing me to shift and turn the wheel (no power steering). After that experience I was drivng the 1988 Thunderbird then I found a great deal. Bought a 1992 Thunderbird for $150. It only needed the engine put back together after the guy took it almost completely apart trying to put in new fuel injectors. Found a great motor for $250 and have been driving this since April of 2002.It is the crystal blue frost metallic with a medium blue interior. I have added a spoiler and hood cover to it. Also replaced the cassette player with a nice Pioneer CD player. It recently had to have the power steering pump and pulley replaced after it burnt up after a fluid leak. Caused the serpentine belt to come off and everything. Then the very day that was fixed my transmission went out and had to replace that. Seems to be doing fine now. Knock on wood. In the next 6 months or so I will be looking to get a '96 or '97 Thunderbird or late model Riviera. My two favorite cars.